Visit TASER's WEBSITE or call or email us for details. If you use your TASER in self-defense, we recommend that you leave it attached to your attacker, incapacitating him while you get to safety. When you fire the TASER X26C, it will deliver a 10-second energy burst. However, pull the trigger two more times, and the burst is increased to 30 seconds, giving you a window of opportunity to get to safety. 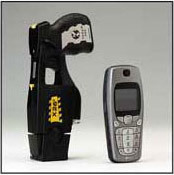 You can then set down the TASER X26C, and it will keep him incapacitated while you get to safety. Send us a copy of the police report, and we will replace your unit free of charge. Your life is worth more to us than the cost of a TASER device. TASER energy weapons are not considered firearms. They can be legally carried (concealed or open) without permit required in 43 states. Prohibited use in DC, MA, RI, NY, NJ, WI, MI, HI & certain cities & counties. CT and IL legal with restrictions. 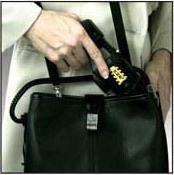 Check local laws on carrying stun guns, conducted energy weapons and electronic control devices. Law enforcement weapons have some features, including extended range, not available for private use.